Researchers say a fossilized whale skull pulled from sandy muck outside Charleston, S.C. indicates that biosonar was being used over 32 million years ago. It also indicates that toothed whales were stranding in the sand over 32 million years ago. These same researchers inform that ancient toothed whales had air sinuses in their heads that enabled their biosonar system. This means that undersea earthquakes have been causing toothed whales to strand in the sand for at least 32 million years. Sperm whales do it. Dolphins do it. Orcas do it. And now, researchers have unveiled the fossilized skull of a 28-million-year-old marine mammal that did it too – used sound to find its next meal or swim safely through turbid waters. After comparing the nearly complete skull with those of other fossil cetaceans, the team placed C. macei on the evolutionary tree just above the common ancestor to all toothed cetaceans. 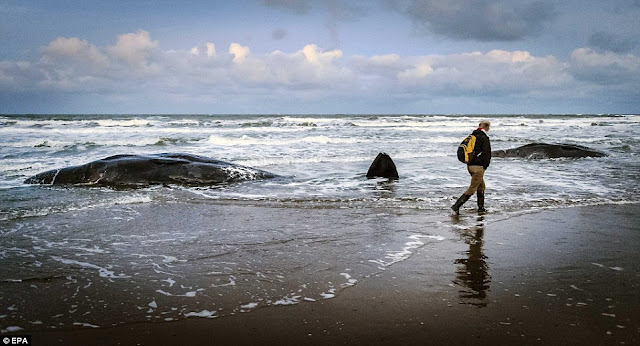 That branch of the whale family uses echolocation to find its food, unlike their cousins who feed by straining seawater through boney baleen plates. Right and humpback whales are modern examples of these strainers. The study "provides an important new piece of information on when echolocation originated, such that it originated almost immediately after the split between baleen whales and toothed whales," notes Frants Jensen, a researcher at the Woods Hole Oceanographic Institution in Woods Hole, Mass., who studies marine echolocation. Researchers have long been interested in the evolution of this natural sonar, or echolocation, in marine mammals because it's a complex way of finding prey or navigating. Sperm whales, the largest toothed whales on the planet, echolocate by sending out relatively widely spaced, sharp clicks – comparable to the sound of hitting too spoons together. Some searchers have noted that each whale has a unique rhythm that allows it to distinguish the sounds it sends from those of other whales. Dolphins echolocate with a series of tightly-space clicks that resemble the sound of a creaking hinge on a slowly opening door. The pitch and timing of an animal's echolocation often is tailored to its surroundings. Harbor dolphins, for instance, use a frequency that falls within a narrow window of relative silence amid the clutter of underwater noises in a harbor. The pitch and the pattern the dolphins use make it difficult for hungry orcas to find them, according to bioacoustic scientists Lee Miller and Magnus Whalberg at the University of Southern Denmark. With the newly described C. macei, New York Institute of Technology researcher Johnathan Geisler and two colleagues have opened a window on the early evolution of this capability among toothed cetaceans. The skull was unearthed from a drainage ditch that forms one boundary of a housing development in College Park, S.C.
Construction of these developments began in the 1970s, and as the drainage ditches were dug, "they hit this really rich, muddy sand that's produced a huge number of fossil cetaceans," Dr. Geisler says. "You never know what you'll find in your backyard." Yet while the fossils have piled up, few have been formally described. The skull Geisler and his colleagues analyzed came from this collection, which is housed in the Mace Brown Natural History Museum at the College of Charleston. Even before the team explored the more-subtle evidence for C. macei's primitive echolocation tools, two aspects of the skull leaped out as highly unusual, Geisler says. "Cetaceans have very strange skulls, particularly the toothed whales, dolphins, and porpoises," he explains. Many of the bones associated with the snouts, or rostrum, extend back to cover much of the skull – a feature known as telescoping. It's a feature that becomes more pronounced as ancient lineages of toothed cetaceans evolved into today's animals. The newly described skull shows a degree of telescoping usually seen in today's cetaceans, he continues. And it isn't seen in other members of the extinct family to which this species belongs. 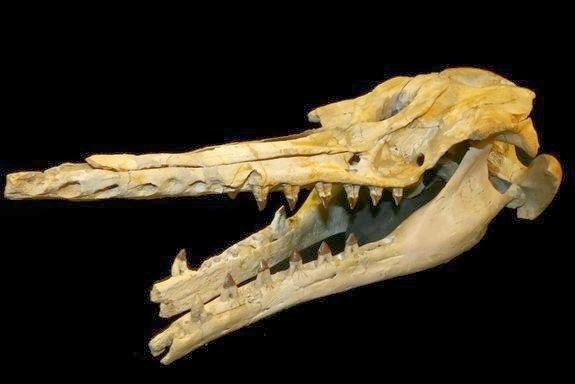 In addition, skulls of toothed cetaceans aren't symmetrical. For instance when two halves of the skull fuse as the young mature, the line marking the junction is off center. This specimen displayed that offset. In addition, when looked at head on, the face was twisted slightly counterclockwise. One sinus was noticeably larger than the other. As with telescoping, this asymmetry in the skull was far more pronounced than one might expect in a specimen this old. "There were a lot of enigmas with this specimen," he says. As the team analyzed the skull, they also found deep cavities they they eventually interpreted as the locations of air-filled sinuses. Such sinuses play key roles in echolocation. After identifying these features, the team found others that have been associated with echolocation in modern toothed whales, dolphins, and porpoises. Even the extent of telescoping fell into place, since the bones would have helped support the complex array of muscles involved in generating, aiming, and receiving the sounds. If C. macei was able to echolocate, it suggests that this capability first evolved in toothed cetaceans between 35 million and 32 million years ago, the researchers say. Reflecting on the somewhat pedestrian site that yielded this and other marine fossils outside of Charleston, Geisler acknowledges that "there is a natural pull in our field to do something really exotic. There's a logic behind it because often people aren't looking in these places. But it doesn't mean that there may not be something really cool close to home. This is definitely one of those cases."